Hiya guys, how's it going today? Well I hope you're having better weather than I am, because it's pouring rain here in Jersey. I hate the rain above all else, makes every bone in my body ache and hurt. My body could also be reacting to the fact that I haven't slept... in almost 24 hours. I was gaming so hard this weekend with World of Warcraft that I forgot all about a little thing called sleep. That's another reason I'm posting earlier than I normally would, because I loved to take a nap as soon as I get home. Surprisingly last night I managed to sneak in some nail art to show you guys. 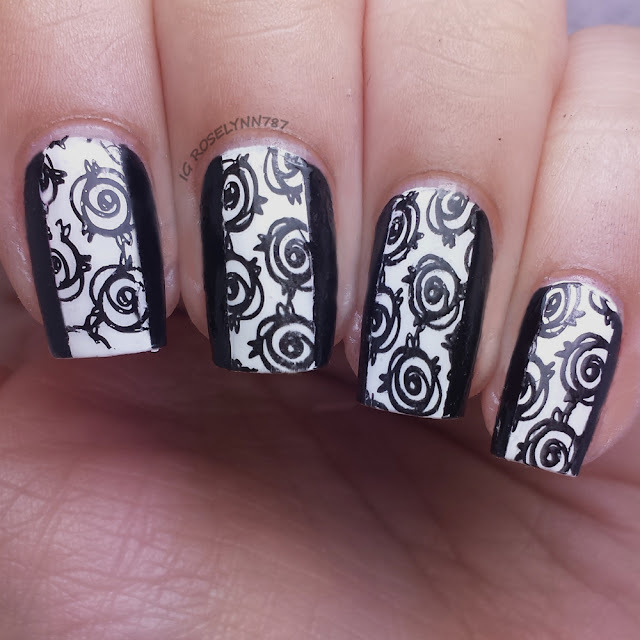 To be honest, I ended up receiving the new The Carnival stamping plate I ordered from Winstonia over the weekend. Of course, I wanted to play with it as soon as I got it haha. Do you think it would look better with some color? I feel like maybe I should of done some coloring, but at the same time I enjoy the simplicity. This is such a fantastic plate though I'm not worried about it. It's going to get a lot of use in the near future! I used my two favorite polishes of all time Black Out and White On from Sally Hansen's Xtreme wear line. For the stamping itself, I used Konad black stamping polish. 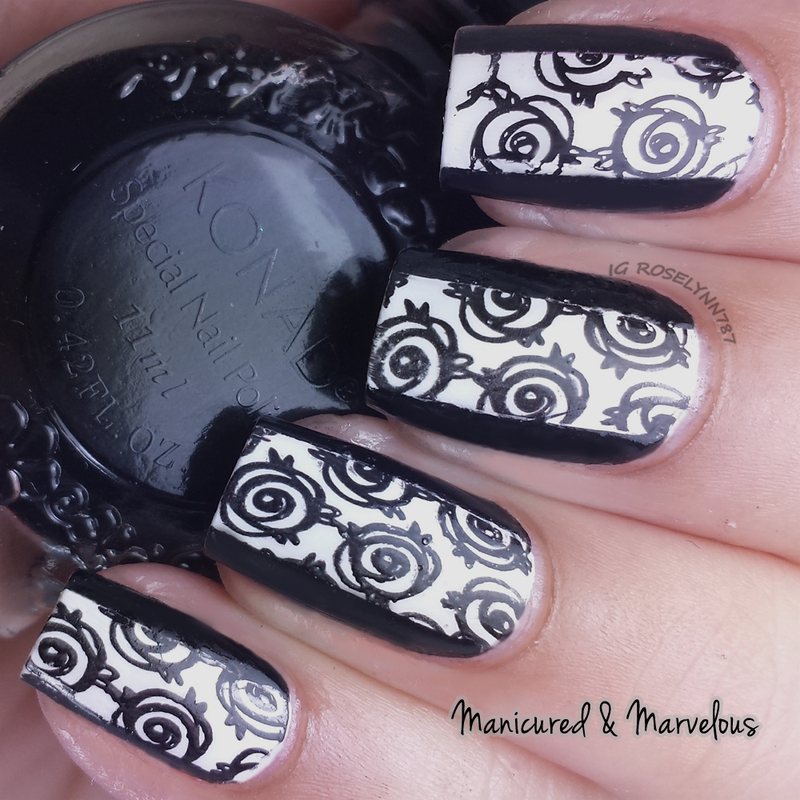 And as I mentioned before, the stamping plate is the new The Carnival stamping plate from Winstonia. Lots of fun patterns on this plate, I can't wait to play with it some more. The mani itself is actually really simple and can looks a little fancy in my opinion. Like something you'd wear with a little black dress to a party. I made a quick video showing you guys what I did to create this mani. Keep in mind, however, that it is speed up to fit 15 seconds in order to show it on Instagram. Enjoy and let me know what you think! I actually really like just the black and white, gives it a more elegant look. That plate looks amazing, and I think I'm going to have to order one for myself. Thank you. I definitely think you should get the plate, it has so many cute patterns. I didn't care for the two other new plates that were released with this one though (the Thanksgiving and Xmas ones).